Holy crap I feel old. A card that's been skulking around since November is Sanctuary Guard Dragon. When ridden, you toss a card in your hand to call ANY Grade 1 Royal Paladin from the deck, and Late Game, he gain 3k for every Grade 1 rear-guard you have. I like Sanctuary as a concept, but his biggest flaw is that he's grossly undersupported. It's true that his non Limit Break ability is fair enough, but trading a card for a booster on a 1:1 basis doesn't really resonate with me. 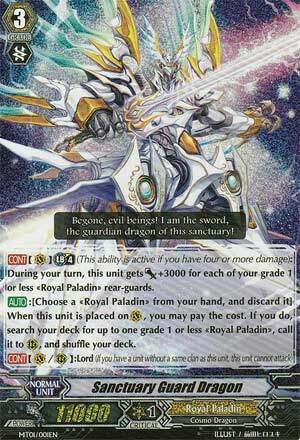 Especially since the single best card to combine him with (Sword of Hope, Richard) isn't actually out in English (at the time of this review, anyway). If it was, it would be possible to make a somewhat decent build with him because then true plusses could be achieved. His Limit Break is sadly not that much better. It's basically attempting to force out 10k more guard on a good day, but to be honest, I can name other cards who can basically do his thing for less, and in some cases sooner. There's not even much point trying to achieve it early since the opponent will not yet be at a point where they want to guard the Vanguard anyway, so eating damage for this doesn't help. Until Sword of Hope Richard comes out, I wouldn't bother with Sanctuary Guard. He's just not worth it.